Google News for mobile lets you keep up with the latest news, wherever you are. Today we’re excited to announce a new feature in the U.S. English edition called “News near you” that surfaces news relevant to the city you’re in and surrounding areas. Location-based news first became available in Google News in 2008, and today there’s a local section for just about any city, state or country in the world with coverage from thousands of sources. We do local news a bit differently, analyzing every word in every story to understand what location the news is about and where the source is located. 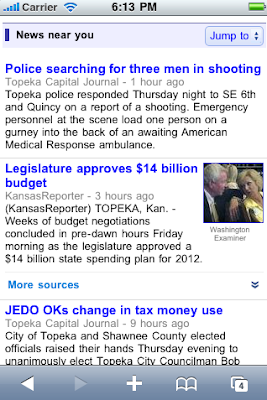 To use this feature, visit Google News from the browser of your Android smartphone or iPhone. If this is the first time you are visiting Google News on your phone since this feature became available, a pop-up will ask you if you want to share your location. 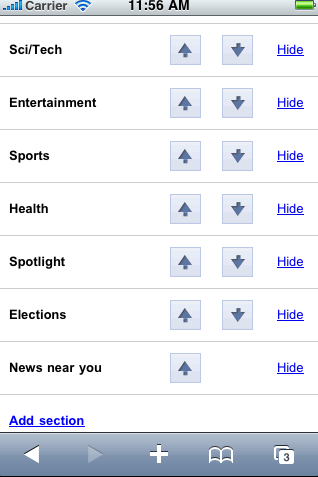 If you say yes, news relevant to your location will appear in a new section called “News near you” which will be added at the bottom of the homepage. You can reorganize the sections later via the personalization page. You can turn off the feature at any time either by hiding the section in your personalization settings or by adjusting your mobile browser settings. Please visit the Help Center for further details. So, go to news.google.com from your smartphone and get the latest news from wherever you are. Google: Love your products, but why aren't all of your blogs mobile-enabled, especially this one? I know Blogger has an option for mobile-friendly mode, so why not turn it on for all of your blogs, or better yet, make it default for all Blogger blogs! I think Edwin is right on with this. More and more I'm using my Android phone for things instead of my computer. Mobile is the way to go! google mobile blog.. Nice post. m so enjoying the implimentation of new moble google.....it get you connected all the way!